We talk and hear a lot in this life about how starting is the hardest part. Initiating a project, turning the seeds of an idea into the fruits of a reality. It's true: starting something has its particular challenges, often marked by fear or anxiety on top of the practical hurdles of building something from scratch. But there is also (hopefully) the catalyzing energy of excitement in the beginnings of a thing. Even fear or nervousness are active energies, if you think about how they feel in the body. What we don't talk or hear as much about is how hard it can be to sustain something. To keep showing up once you've started, once the shimmer of anticipation has dulled and all the other demands of life begin to take up equal space again. The challenge of continuing to be excited or trust that a project is worthy of steadfast effort even if it is unfolding differently than you had imagined. Three months ago, I got a full-time job for the first time in over two years. It's amazing and I love it. And. Holy wow has my life changed—particularly in terms of time. Bandwidth. Ability to devote myself to the activities and projects that nourish me. It is has literally been a challenge to figure out how to spend 8.5 hours at work, commute, cook/feed myself properly, go to yoga, spend time with friends and rest. Add to that my second job teaching 2x a month on Sundays (which started up again mid-September), traveling, being a bridesmaid in a dear friend's wedding, hosting an epic Rosh Hashanah dinner and dealing with a crashed laptop which left me computer-less for a solid three weeks (and without photo editing software for the following four)...you can maybe begin to get an idea of where I've been lately. Which has not been on here. And still: I am sinking my feet into the practice of showing up. Of meeting myself where I am. Of allowing the ebbs and flows of life that are beyond my control to direct my activity but not dictate it. Of practicing presence, mindful prioritizing and re-commitment in each moment to the things that matter. So that's where I've been. And where are we all now? Wow, November. We're in the midst of a potent seasonal and energetic shift at present. Samhain (a Gaelic word, pronounced SOW-in), the Pagan festival of the Dead and the last day of the year according to ancient earth-based calendars, is a festival celebrating the end of the harvest and the beginning of the dark half of the year. In some traditions it is observed on October 31st; in others, it extends from October 31st until the moon is new in Scorpio, which falls this year on November 18th. The most mysterious of the Zodiac signs, Scorpio is the sign of life, death and resurrection, of passion and hidden depth. Of turning inwards; doing deep work. Samhain begins on Autumn's cross-quarter day—the midpoint between autumn and winter. Every season has a cross-quarter day, which is the time at which the energy of the forthcoming season begins to percolate, even though its visible manifestations won't emerge for another six or so weeks. I'm compelled by the idea of cross-quarter days, rife with wisdom and metaphor: The insistent slowness of and necessary patience with major transitions or energetic shifts. The fact that everything begins in the dark. In many ancient calendars (including some that are still observed, like the Jewish calendar), each day ends and begins at sundown, beckoned with the veil of the dark. In Pagan and earth-based calendars, the new year begins on Autumn's cross-quarter day, aligned with the emergent energy of the darkest season of the year. Babies are seeds planted and nurtured in the womb. Ideas are sparked in the depths of the mind before they are ever brought to life in the physical realm. I find such peace and beauty in this: the idea, evidenced to us by the processes of the natural world, that just because we cannot yet see the physicality of a thing does not mean it is not there, brewing. Does not mean work is not being done. It substantiates the quiet. The ruminations. 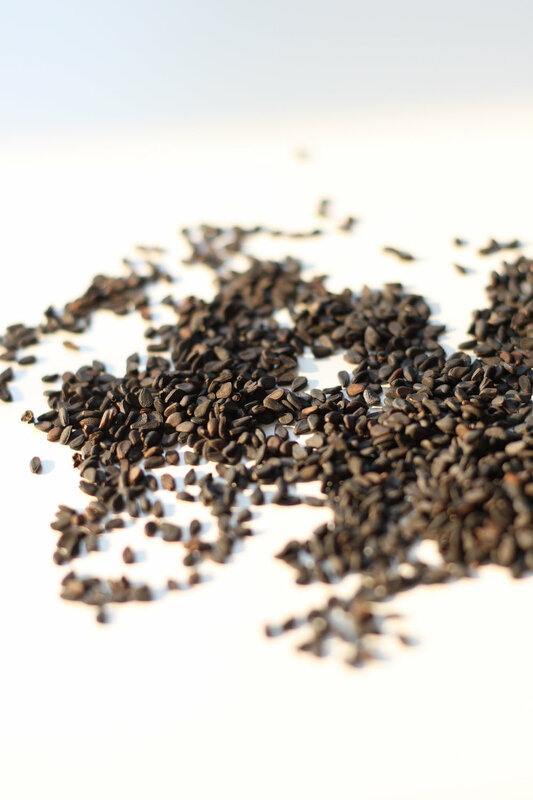 The seeds. The days are darker now than they are light. Let yourself align with it. Turn inwards. Slow down. Reflect. Release. Reconnect to recuperate. The earth is inviting you to; with such inherent wisdom, it seems rather wise to listen. 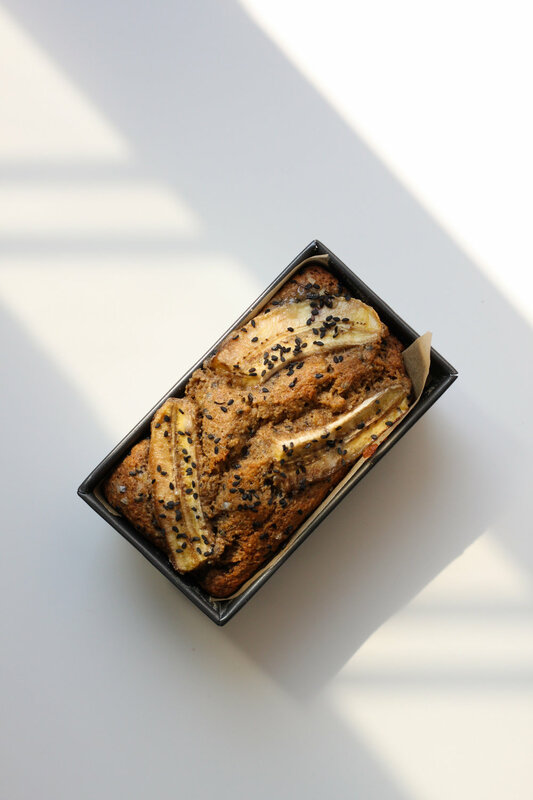 Notes about the recipe: I actually made and photographed this tahini banana bread over Labor Day (that's the first weekend of September, for those of you non-Americans on here) and took it to two potlucks that weekend. Not to brag or anything, but multiple people from both gatherings asked me for the recipe. (Yeah okay I am totally bragging. But also trying to convince you that this banana bread is 100% worth making.) 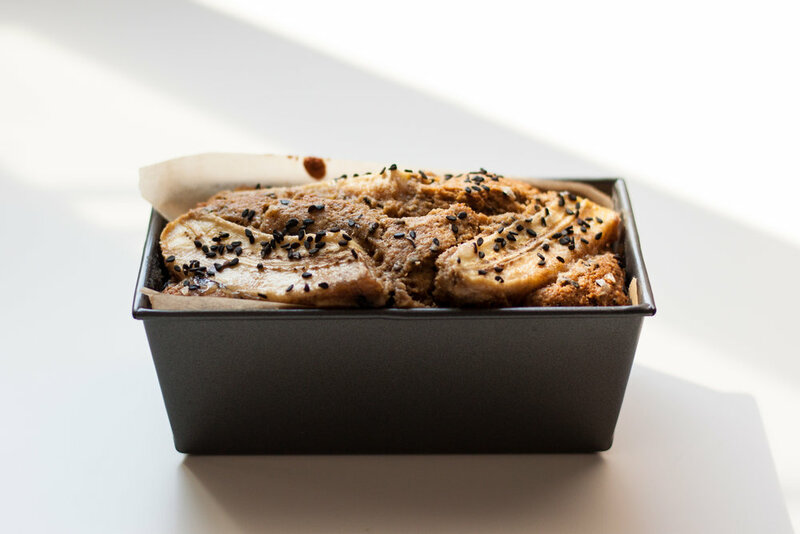 It's completely whole grain, has an atypical depth of flavor from the buckwheat, almond meal and tahini, and is made with relatively little sugar for a sweet bread. Win-win-win. Did I mention it's ridiculously delicious? 1. Preheat oven to 350°F. Grease and line a loaf pan with parchment. Set aside. 2. 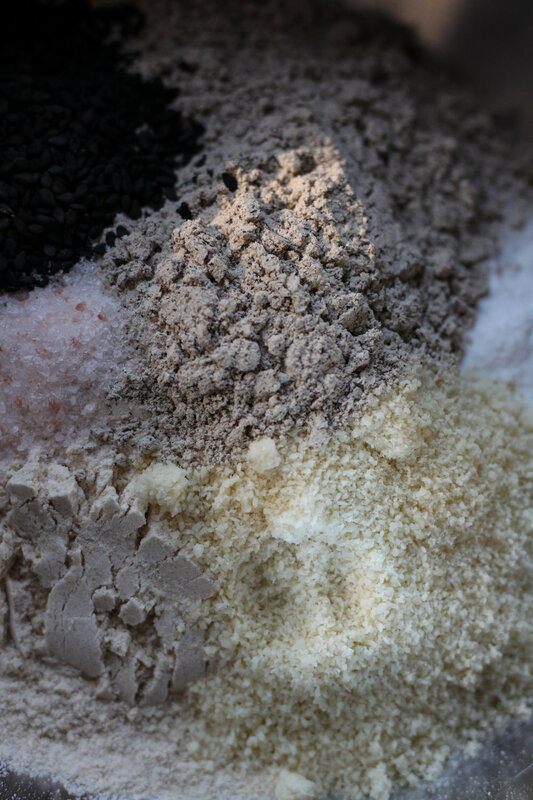 Mix flours, sesame seeds, salt and baking soda in a bowl. Set aside. 3. In a separate medium bowl, mix coconut oil and sugars together until the sugar begins to dissolve. Whisk in egg and vanilla extract until mixture is smooth and thickened. 4. Add tahini and the mashed bananas to the wet ingredients. Stir until thoroughly incorporated. 5. Pour the dry ingredients into the wet. Gently stir together until just combined (it's okay if the batter is a bit lumpy). 6. Pour batter into prepared loaf pan. Sprinkle additional sesame seeds on top, then place the two long slices of banana on top, cut side face up. Push them down into the batter so they settle a bit. 7. Set pan on baking sheet (it's easier to pull out of the oven this way). Bake until a toothpick inserted in the center comes out clean, about an hour.